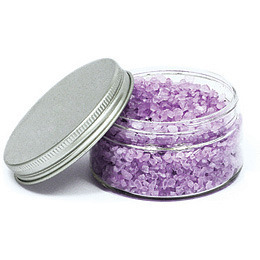 Jar of aromatic fine bath salts or bath crystals. Transparent PET jar with stylish aluminium cap. Great decoration area on the cap to give your logo maximum exposure. Contains approx 100 grams. Colours/Fragrances: apricot (orange crystals), balsam (green crystals), boronia (pink crystals), lavender (purple crystals), lemon (yellow crystals), strawberry (dark pink crystals), vanilla (cream crystals), apricot (orange fine salts), frangipani (yellow fine salts), lavender (purple fine salts), lily of the valley (green fine salts), floral bouquet (blue fine salts).